Hi, I’m Opal Scott, and I have the most marvelous friends. Two of them, Naomi and Edna, have been my best friends since kindergarten, and when I say “best”, I really mean it. When I was seventeen and about to head off for college, I discovered I was pregnant. This was just over thirty years ago, and my parents were not what you’d call understanding. I had no one to turn to. No grandparents, aunts, uncles, cousins, siblings. No one but my two best friends. To them, it was perfectly natural that we’d all go to college together as planned, and look after my baby between us. And that’s what we did. Haylee, my daughter, has three mothers. We obtained our degrees, enjoyed great careers, and raised the most wonderful daughter anyone could ever want. We also had hobbies that we loved, all of them involving making things with fabric, thread, yarn . . .
Haylee turned out to be the best seamstress of us all, and always dreamed of opening her own fabric shop. When she saw a block of four shops for sale in a village in northwestern Pennsylvania, she told us about it, and before we even turned fifty, we quit our jobs and opened stores. I own Tell a Yarn. Edna has a notions shop she calls Buttons and Bows (and no, Edna didn’t climb this tree to hang crystal spangles from it, though I can imagine her doing it—that’s ice), and Naomi has a quilting shop. Before long, our village had a nickname—Threadville, and tourists were flocking to it. Recently, Haylee’s best friend, Willow, opened a shop selling everything everyone would want for doing their own machine embroidery. Willow, like our Haylee, is spunky, but all of us could see vulnerability behind her eyes. Personally, I think her parents were distracted when she was growing up and she had to raise herself. She did a good job of it, but Naomi, Edna, and I can’t help wanting to give her some of the attention and support she lacked. And then that nasty Mike Krawbach went and got himself murdered in Willow’s back yard, and that old fool of a policeman wanted to pin the blame on Willow, and the river threatened to wipe out the cottage she hoped to renovate and rent out, and what could we do? Haylee, of course stuck by her best friend, and Edna and Naomi and I rallied around her, too. As far as we’re concerned, we have a second daughter. Life is good. What about you, do you have friends like Naomi and Edna who just give and give, and you know there is no way you can ever pay them back? 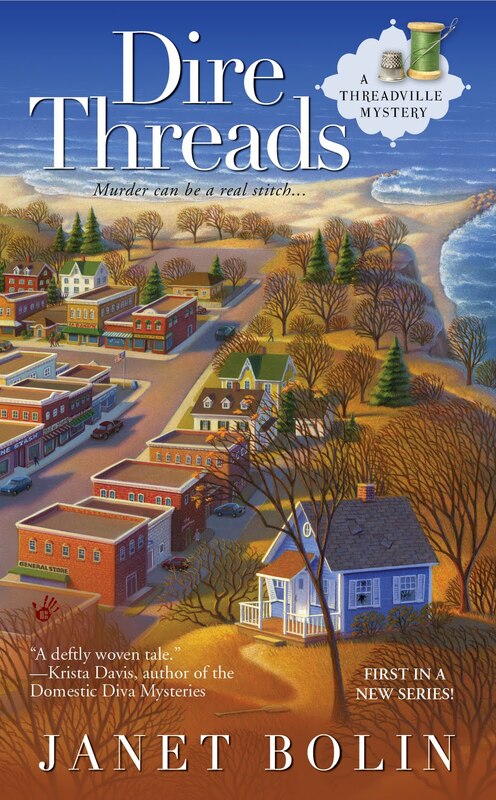 DIRE THREADS will be in stores June 7! Meanwhile, you can pre-order it. I can not wait to meet you, the other moms, Haylee and Willow. I'm positive with all of you, you'll find the person who killed Mike. Thank you, Dru. I'm very proud of both Haylee and Willow. Friends are the glue that keeps life from unraveling! I don't know what I'd do without mine. Stay strong, all of you! You'll figure out whodunnit. You're so right, Victoria. I'd be lost without my friends. I still value my "old" childhood friends and have added others along the way who are very dear to me. My critiquing group has morphed into more of a sisterhood and I'm truly blessed. Looking forward to reading about how you unravel the mystery! I do have great friends and I know I can count on them! Thanks for reminding me of how important they are in our lives. I am really looking forward to meeting your friends and visiting Threadville. I have fabulous friends and I count on them, as well. One from childhood, one from college, and two on the INternet who I would be lost without. And then there's family and "extended" family...the kind that will not turn their backs on people. I'm blessed with those as well. Lucky. THat's what I am. Love to you, Opal. May your "extended family" simply continue to grow. May your adventures with Willow be colorful. I know they will. Erika, Mary Jane, and Avery, I agree. Good friends stick with you, even when (as in my case) family lets you go. And it's wonderful to keep adding to my "extended family!" I have friends who are better to me than I deserve! 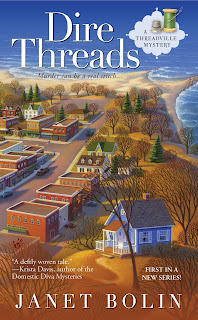 Can't wait to hear all about life in Threadville. It's a relief to know that you three mothers have taken Willow under your wings and will watch out for her! Thanks, Krista! We also worry about other characters who post here. We'd "adopt" them all if we could. Thanks, Heather. I hope everyone will enjoy reading about the comfortable friendship I share with my two pseudo sisters, and with the supportive Threadville tourists who come to our needlecraft shops to browse and learn new skills. adding to my evergrowing ToBeReadList!!!! Thanks, Cynthia! Willow hadn't been in Threadville very long before horrible things started happening to her. My friends and I had to help!